A bag for everyday use especially conceived by Louis Vuitton fashion house with modern women in mind, Monogram Empreinte Speedy Bandouliere 25 Celeste is a model that should not miss from any fashionistaâ€™s wardrobe. Coming in a small size and sweet chromatic tones, this bag can suit almost any style and trend, remaining a reliable accessory all year round. Because it is made of high quality calf leather and equipped with both with strong rounded handles and a bandouliere shoulder strap, Monogram Empreinte 25 Celeste is sophisticated and durable at the same time. All day long and every day of the week, you will be wearing a Monogram Empreinte fashion item that says so much about your style and taste. The monogram embossed leather really makes it stand out from the crowd, being the most recognizable brand attribute. Monogram Empreinte Speedy Bandouliere 25 also comes with polished brass hardware features, among which we mention the brass zipper ending in a leather pull with padlock. 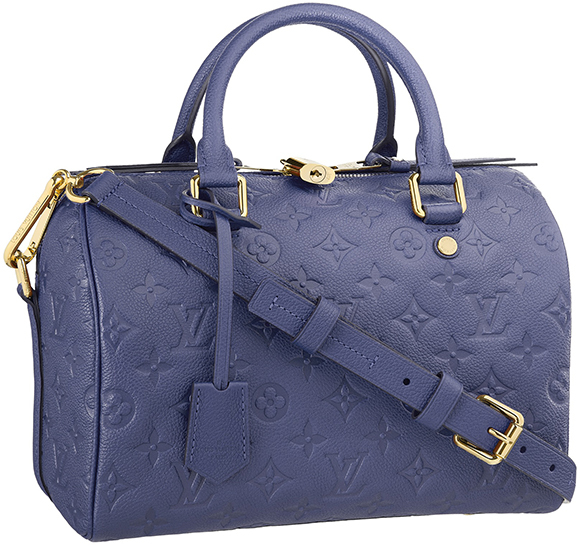 If you open the top zipper, you will notice that the fabric inside the bag matches the color of the leather, and this is just another proof that with Louis Vuitton bags every single detail is thought to perfection. Besides the Celeste model that has a deep blue color, the same Monogram Empreinte Speedy Bandouliere 25 bag is also available in other chromatic tones like dark brick red (Grenat), rich raspberry red (Aurore ), strong yellow (Safran), deep midnight blue (Infini), Â powerful orange (Orient), dark purple (Aube ), light purple (Jaipur), and chocolate brown (Earth). Whichever of them you will choose, you will certainly feel the luckiest woman on earth for having a reliable bag that makes you look trendy and stylish at the same time.